This opposition to housing on the reservoir was largely fueled by support from advocates for City College’s future use of the land, who came from both inside and outside of the institution. The ballot referendums framed the issue as City College-versus-housing. In a show of support for the storied and esteemed college, the electorate picked the former; the City College coalition won. That victory ultimately led to an important result for the college’s future: in 1991 Mayor Art Agnos gave half of the reservoir property to the institution. CCSF Guardsman, 25 Oct 1991. CCSF Archives. Read whole article. A recent move by a City College–based group could be seen to mirror that history; they have filed to put a proposition on the 2018 ballot, asking that the City prioritize completion of the college’s long-delayed Performing Arts Education Center (drawings) on adjacent land before allowing the current proposed housing project to go forward. That story is unfinished. To return to history. After evicting City College from the numerous WWII Navy-built structures on the 28-acre Balboa Reservoir site in December 1955–after ten years of college use–the San Francisco Public Utilities Commission (SFPUC) demolished the buildings and had it excavated and paved as a two-basin reservoir in the late 1950s. The SFPUC then failed to finish the facility, despite being endowed with bonds for that purpose by the voters in 1961 and 1972. Although it is not much a part of the current conversation about the Balboa Reservoir, San Francisco does need reservoirs for emergencies, both for firefighting, sanitation, and domestic use. Before Mayor Dianne Feinstein began to pursue the idea for housing on the site in 1983, there had been a few other mentions of the possibility. In the SF Chronicle in January 1972, James Stretch of the Greater Chamber of Commerce of SF offered his idea to put middle income housing on the land. Jan 1970, SF Planning Dept. Indeed, the college itself assumed as much; the 1971 CCSF Master Plan, drafted by Pflueger Architects and approved by the San Francisco Board of Supervisors, showed the whole of the reservoir property being utilized, complete with an auditorium the college was even then badly in need of—all with active reservoirs underneath. 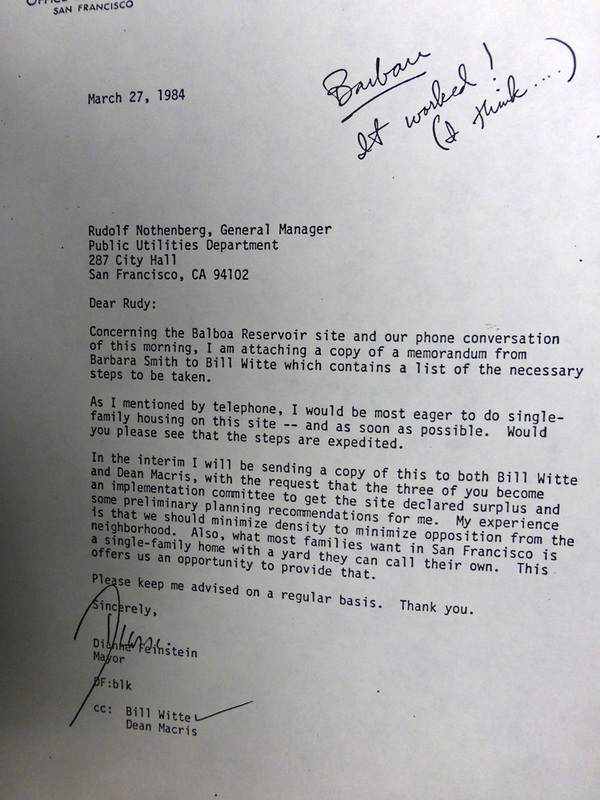 In 1983, Mayor Feinstein wrote to Rudy Nothenberg, General Manager of the SFPUC to ask about potential availability of the whole 28 acre site for “up to 800 units” of housing. She framed it in terms of being urged by community groups to pursue housing on the site. The reservoir was public land and belonged to the SFPUC. 9 Jun 1983. 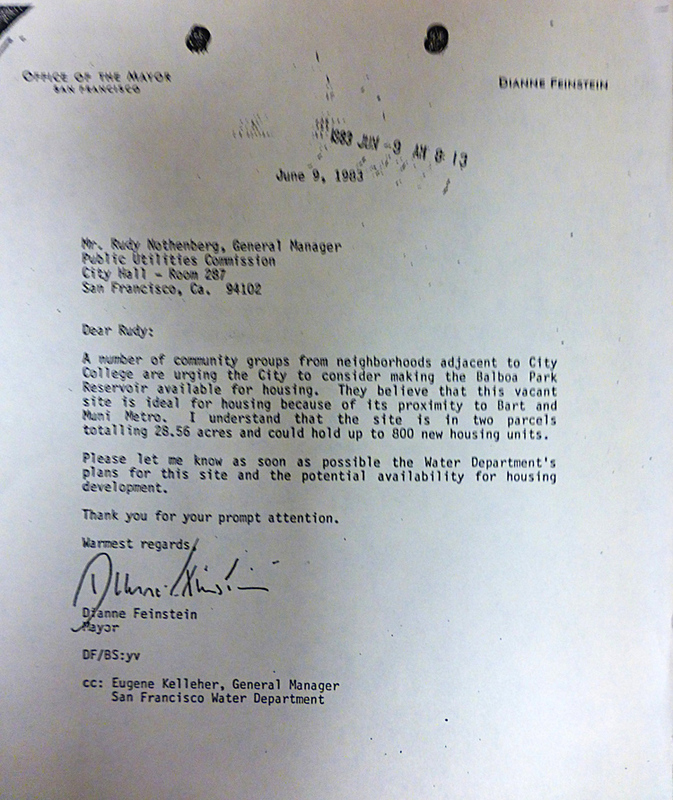 Letter from Mayor Dianne Feinstein to Rudolf Nothenberg, General Manager SFPUC, exploring possibility of housing on the Balboa Reservoir. SFPUC Archives. Photo: Harry Bernstein. View larger. In July 1983, just a month after Feinstein’s exploratory letter, the Utilities Engineering Bureau of the SFPUC prepared a site map. Jul 1983. Site map for Balboa Reservoir. SFPUC Archives. Photo: Harry Bernstein. View larger. In March 1984, Feinstein wrote again to Nothenberg, urging him to work with Bill Witte and Dean Macris in the Mayor’s Office of Housing and Economic Development (MOHED) to get the site declared surplus and develop a plan. “My experience is that we should minimize density to minimize opposition from the neighborhood.” What Feinstein did not seem to see coming was opposition from within City College. 27 Mar 1984. Letter from Mayor Dianne Feinstein to Rudolf Nothenberg, General Manager of the Public Utilities Commission. Handwritten note is to Barbara Smith of MOHED. SFPUC Archives. Photo by Harry Beinstein. View larger. Although Feinstein wanted both basins, the SFPUC capitulated to only half her request. The commission declared the south basin as “surplus” in April 1984, thus preparing the way. 24 Apr 1984. The SFPUC declared the Balboa Reservoir, south basin, to be “surplus.” Minutes, SFPUC. View larger. 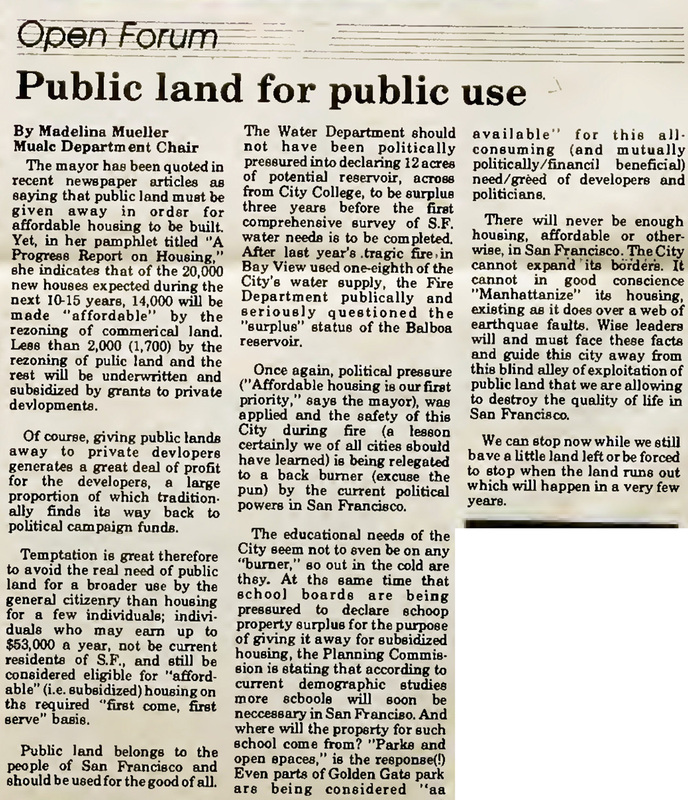 In July 1984, the Deputy City Attorney Burk Delventhal went along with Feinstein’s intention to sell this public land to a developer for a below-market price, saying that the project of low-cost housing qualified it as for a “public purpose” and therefore able to be sold below the market rate. MOHED set the price for the 12 acre south basin property at $36,900, a small fraction of its market value, later prompting repeated accusations of a public land giveaway by those opposed to her housing plan. This was claimed to be the “historic cost” for the land. I’ve been unable to find how this was calculated. The whole 41-acre Balboa Reservoir property was purchased by the private firm Spring Valley Water Company from Adolph Sutro in 1894 for $60,000. In 1930 the City bought all of Spring Valley Water Company’s holdings, over several Bay Area counties, for $40M—over 110 parcels of land—in order to establish a municipal water system for the city. The Balboa Reservoir was among them but the price wasn’t broken down for each parcel. However Mayor Feinstein’s housing people calculated their figure, this was what they stuck to. City College could have sprung for that price; Louis Batmale, Chancellor 1970-1977, had been given to understand then that if ever the reservoir property were offered for sale by the City, the college would be given the opportunity to use it. However, according to CCSF Academic Senate President Joanne Hendricks, when this possibility was ventured in May 1985, Feinstein put the price up to $32 million for the college, which was substantially larger than even market value at the time. This exchange did not bode well for the future relations between those at the college and those at City Hall. 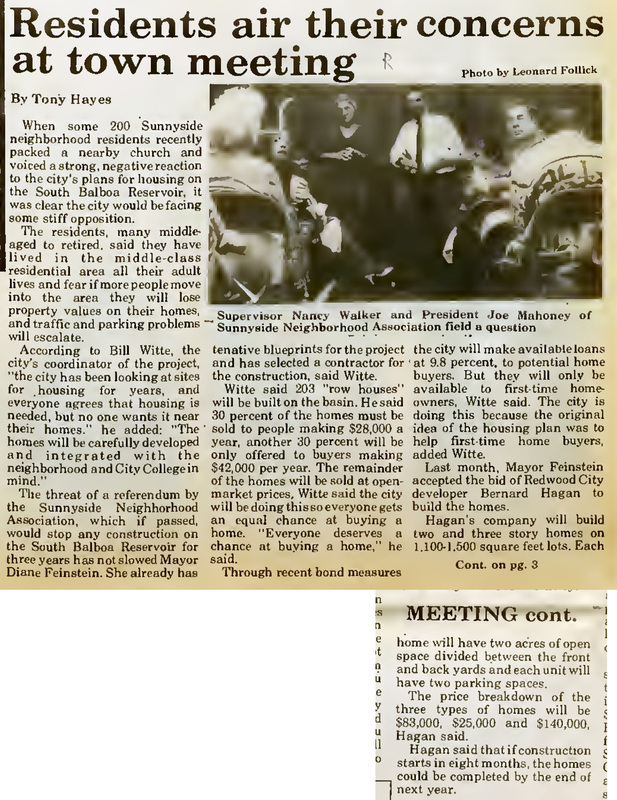 A plan was unveiled in October 1984 to address the city’s housing shortage. At a press conference, Supervisor Bill Maher described the features of the plan: ease the way for developers; give them density variances for including affordable housing; and help buyers with down payments. The Balboa Reservoir was named—certainly the largest piece of public land the plan’s backers thought would be available. SF Chronicle, 22 Oct 1984. View larger. The following April the Board of Supervisors voted to approve the proposal to sell the Balboa Reservoir south basin, along with the Geneva Car Barn and a lot on University Mound. 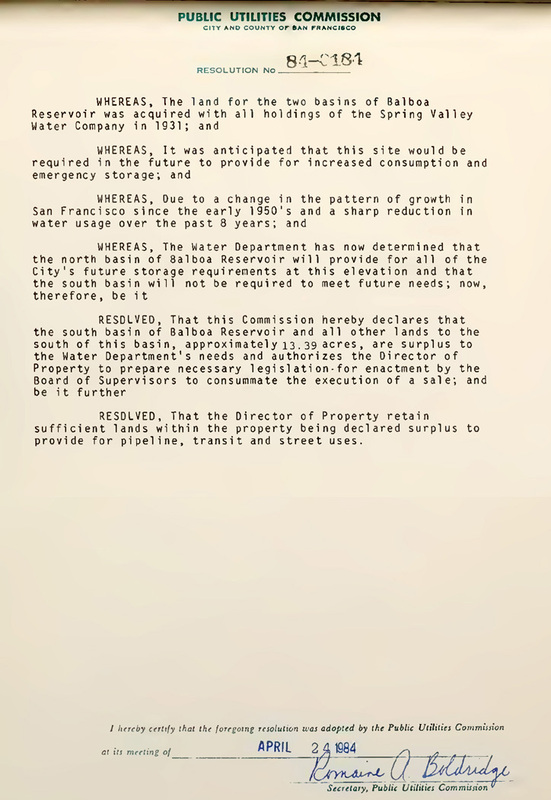 Journal of Proceedings, SF Board of Supervisors, for 22 Apr 1985, approving sale of the Balboa Reservoir. When the Chronicle covered the item, the issue was now clearly framed in terms of City College of San Francisco versus the Board of Supervisors. SF Chronicle, 23 Apr 1985. Read whole article here. At City College, physics teacher Paul G Hewitt raised the alarm, being the first faculty member to point out in print what this sale would mean for the college. He wrote a letter to the editor of the CCSF Guardsman, published 15 April 1985, succinctly summarizing the opposing ideas. Once the land that had been West Campus in the 1940s and 1950s was sold to the one thousand people who could live there, any possibility of using it to serve the present and future needs of the 25,000 students a year was gone forever. Hewitt noted the irony of this happening at the same time CCSF was celebrating its fiftieth birthday. 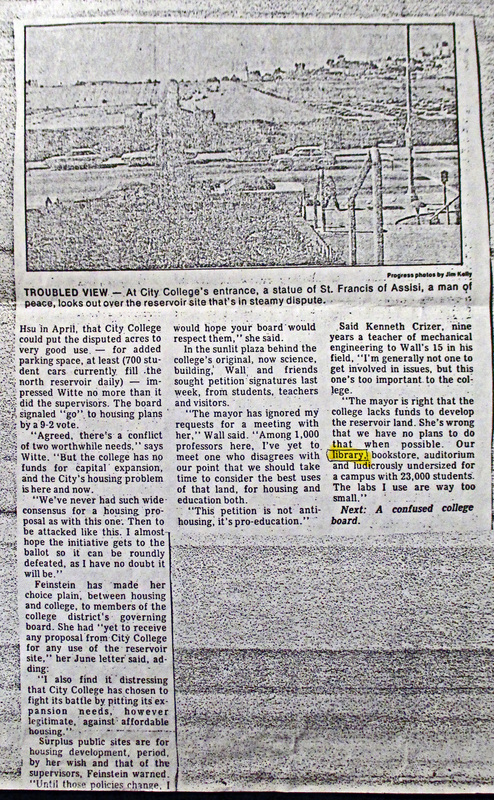 CCSF Guardsman, 15 Apr 1985, Letter to the Editor from Physics teacher Paul G Hewitt, warning the community what the sale of the reservoir would mean for the college. View larger. Before the Request for Proposals for the site went out in May 1985, Feinstein’s people had initially reached out to community groups, and had reassured them as to various areas of concern. But when the RFP was released, it flew in the face of several aspects of what the local groups had come to understand about how the development would be designed. Streetscape: that the developer finance ‘boulevardizing’ of streets between Riordan High School and the Grand Auto lot [i.e. 1150 Ocean Ave]. Also that Brighton Ave be opened for vehicular access. Traffic Study: that the City conduct a traffic study to address the area’s notorious traffic issues from I-280 to Junipero Serra. Feinstein seemed to make some effort to go along with these demands: the plan that was later accepted had 203 single family homes, a 1.25 acre park, an emphasis on homeownership; and plenty of parking. On the other side, access at San Ramon Way was completely blocked in the plan—as the mirror-image street Elmwood Way on the other side of Westwood Park had been when the Dorado Terrace development was built a few years before this. And no community advisory body was formed for ongoing local input and no public forum was held for design review. 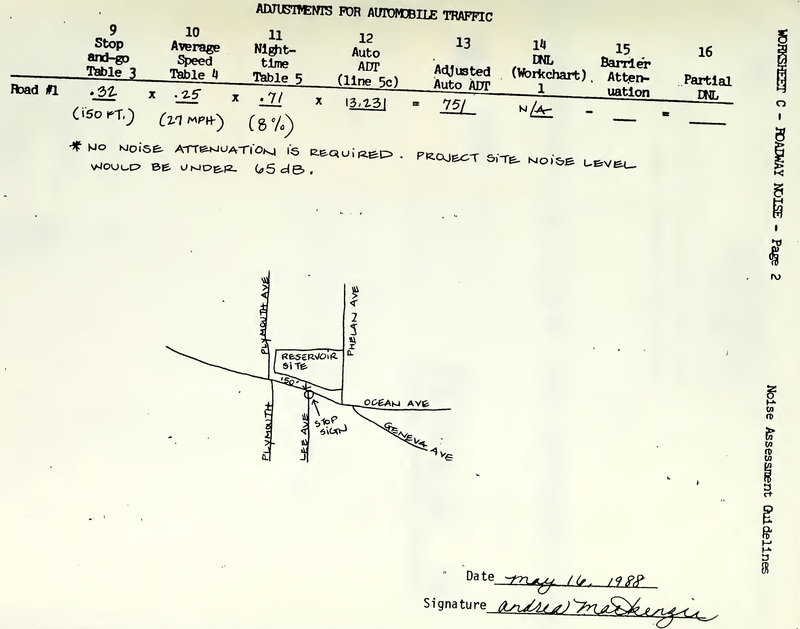 A sense of betrayal is evident in the letter, and may have led to later resistance among some local residents and neighborhood groups, although there were plenty in favor of the housing project. Until Feinstein’s housing project, there had existed a kind of precarious equilibrium between the SFPUC’s stated intention to eventually finish and fill the reservoir, and the City College’s idea of expanding onto the land. First, the college had been getting good use out of the north basin, for needed student and faculty parking, from the moment the asphalt cooled in 1958. Also, there had been an understanding between the two institutions that when the PUC finished the reservoir, the college had “air rights,” that is, within certain limitations, could use the top of the facility if it paid for a strong cover. The 1971 CCSF Master Plan showed the entire reservoir capped and covered with CCSF buildings and grounds. 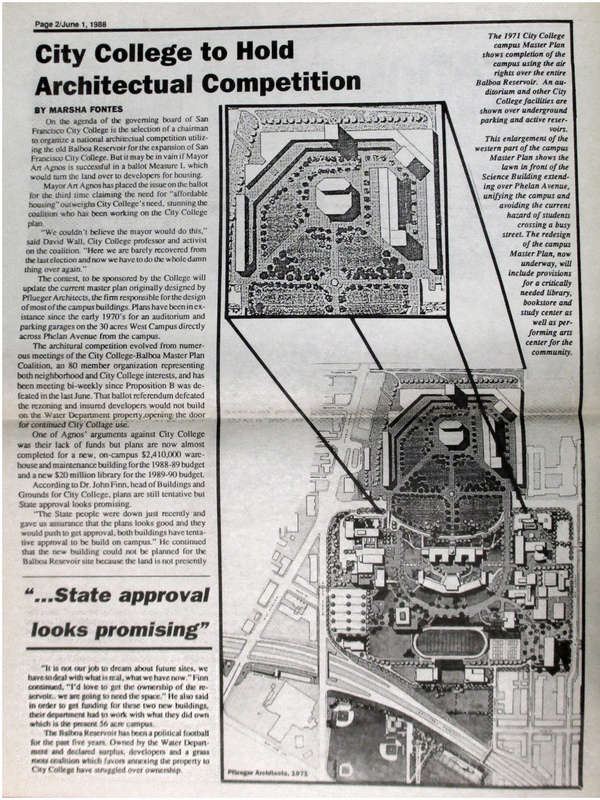 1971 CCSF Master Plan reprinted in the 1988 “Election Alert” newspaper flyer for the No on Prop L campaign. Shows entire reservoir used for college buildings and grounds. San Francisco History Center. View larger. This static balance—in which both sides looked to a future that seem to offer compatible parallel development, at least in theory—was knocked off center by Mayor Feinstein’s determination to build housing there. This would unleash a strong opposition and act as a call to action among many faculty members and students. In September 1985 a developer for the site was chosen, Bernard Hagan, a Redwood City–based builder. Finally there were specifics published about the plan: 203 single-family homes, with a discounted interest rate for the mortgage loans for buyers. 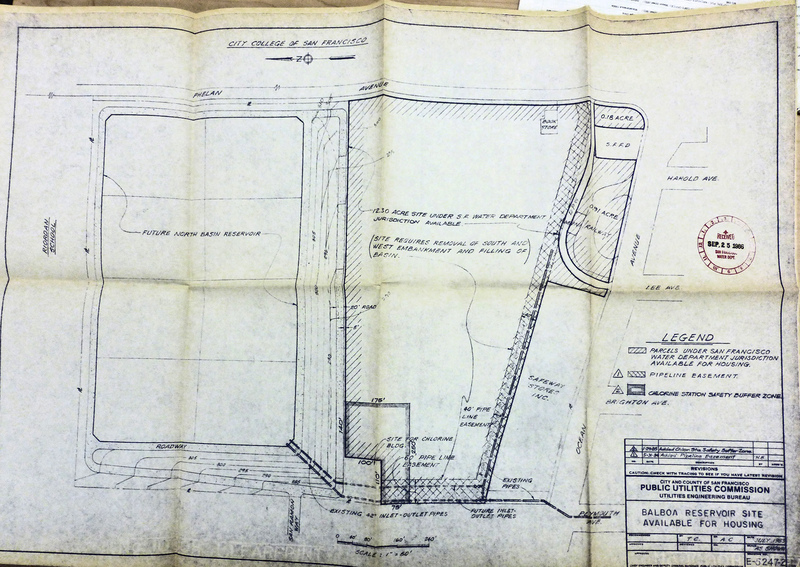 Here are some drawings from the plans (CCSF Archives). 1985. Site plan for “Balboa Heights” housing project for the Balboa Reservoir. View larger. 1985. One of the architect’s drawings of homes for “Balboa Heights” on South Balboa Reservoir. CCSF Archives. 1985. Architect’s plan for one type of home for “Balboa Heights” on South Balboa Reservoir. Overlay of 1985 housing plan for the South Balboa Reservoir on a current map. The notch in the northwest corner of the plan was to accommodate the future location of a water chlorination plant for SFPUC, a feature little mentioned in any of the literature for either side. View larger. 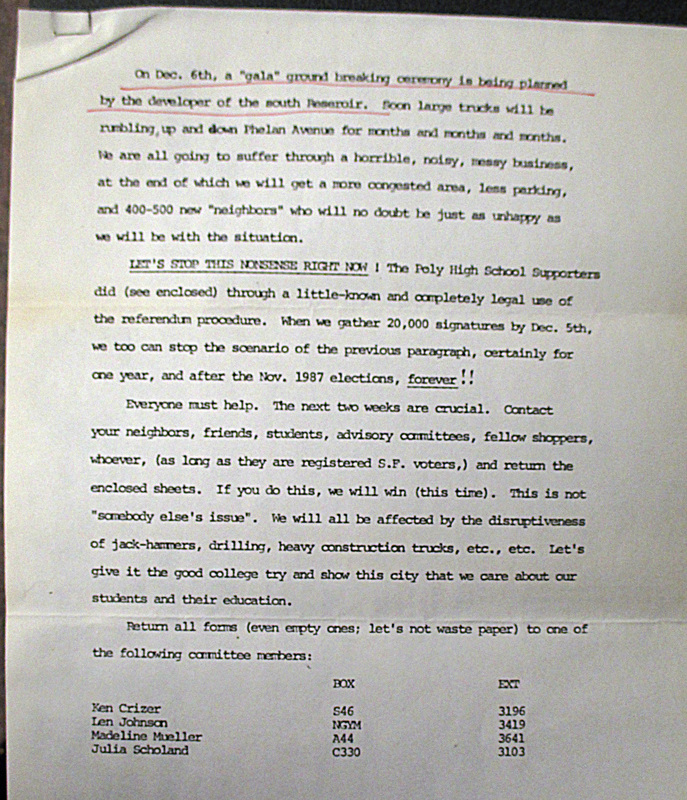 A petition to stop the development with a three-year development moratorium was authored in August 1985 by Jesse David Wall, a physics teacher at City College since 1970. 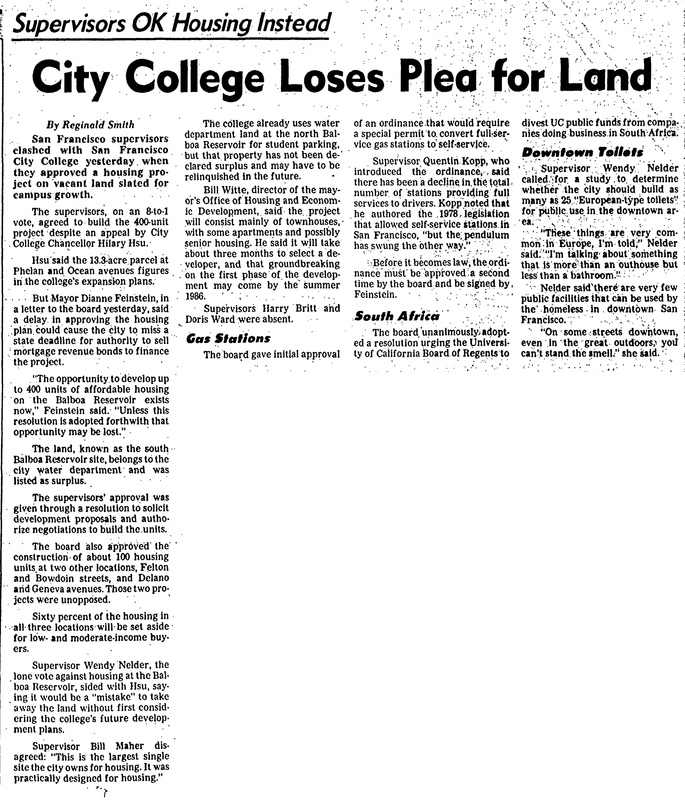 The argument was based in the idea that the land should be reserved for City College’s future expansion, being a campus with less land per student than any other in California. This would become Proposition E in the June 1986 election. Wall had the support of Ken Crizer, a teacher in mechanical engineering, who would also be prominently involved for the years-long battle to come, and Sid Kass, a Miraloma Park resident with experience in community organizing. Wall had initially gotten involved with local issues by organizing a resistance to plans to build a Muni bus yard facility in the South Balboa Reservoir in 1976, a battle that he and a group of local residents won quickly. Wall circulated this petition himself, while building up a substantial level of support among faculty and students at the college. He initially contacted the CCSF Academic Senate, but found them complacent about the prospect of housing on half of the reservoir across the street from the campus. Tipped off by a longtime faculty member who had been teaching since the days that West Campus buildings covered nearly the whole reservoir land, Wall researched that, and revealed a history that had been largely forgotten. His initial research did not reveal the true end date for CCSF occupation of the reservoir land, erroneously finding a date of 1952, something then picked up by others in the ballot arguments to come later. Use of West Campus facilities had actually ended in late 1955. 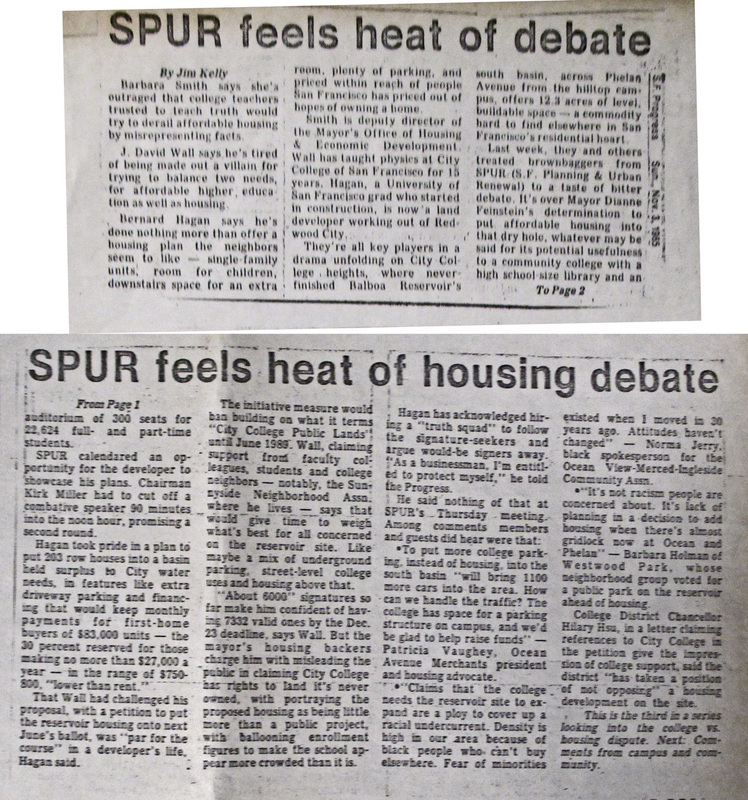 At this point the Chronicle did not see fit to cover the issue or the emerging opposition in their pages, except to advertise a talk about the project at SPUR at the end of October 1985. But the SF Progress published a series of three articles by reporter Jim Kelly investigating the issue, in Oct-Nov 1985. Links to articles below, which are located in the CCSF Archives. 23 Oct 1985, SF Progress, “SF conflict: Housing vs a crowded college” PAGE 1. 23 Oct 1985, SF Progress, “SF conflict: Housing vs a crowded college” PAGE 2. The Progress did a good job of laying out the positions of the three factions: the Water Department hadn’t actually wanted to let go of even the one basin to Feinstein before completing a study of the water needs of the city; the Mayor’s housing team wanted this development built as quickly as possible and was greasing the way however they could; and City College faculty wanted their needs due to growth addressed and the land that was once West Campus reserved for their future—a library, student housing, bookstore, and student union. The mayor countered that she had received no plans from CCSF, and besides the college had no funds for building any of that, even if they were to be sold the land. But these were inconvenient facts for Witte and Mayor Feinstein’s fast-moving project. At SPUR on 31 Oct 1985, speakers Bernard Hagan and Mitchell Green of the Mayor’s “Advisory Council for Balboa Housing” (a term that never again appears in print) gave a brownbag talk detailing the proposed development. Hagan told of the special features he envisioned for the homes there, such as extra driveway parking—the entire project had a parking ratio of 2.4 spaces per unit—and financing to keep mortgage payments for first-time buyer at a level below rent. Among the comments by members and guests at the talk were accusations from a spokesperson from OMI Community Association that racism was playing a part in the opposition to housing, in that density tended to allow minorities to buy. A Westwood Park resident weighed in, saying that there was already traffic gridlock at Ocean and Phelan Avenues, and more housing would only increase this. At this point the Chancellor of City College, Hilary Hsu, stated the official position of the college as “not opposing” the housing development. That college president Carlos Ramirez also did not oppose the project was noted earlier that month in a piece in the Guardsman. Jesse David Wall was also a member and past president of Sunnyside Neighborhood Association; he and his wife Ellen Wall had lived in the neighborhood adjacent to the college since 1972, and in a house just two blocks from the campus on Edna Street since 1973. 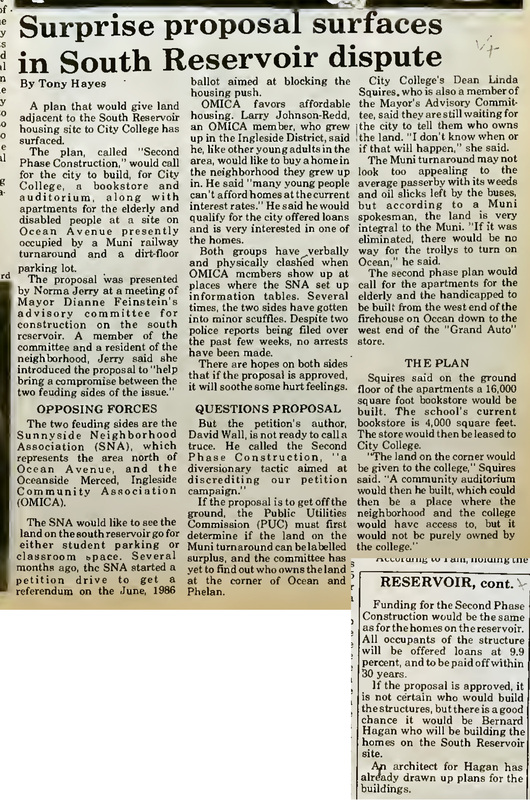 Then-president of SNA Joe Mahoney went along with Wall’s strong opposition to the housing project, allowing the organization’s name to be associated with the petition, although he didn’t personally feel as strongly as Wall did about the prospect of housing on the site. In November he told a reporter: “I feel pretty confident that once the homes are built, people will be pretty happy with them. It’s a high-quality development,” adding that the neighborhood’s main concerns were with congestion and traffic resulting from the development. In September 1985, Sunnyside Neighborhood Association held a public meeting about the housing development at St Finn Barr Church auditorium in Sunnyside. Two hundred people attended, with some present objecting to the proposal citing classic “NIMBY” rationale: increased traffic and parking issues. Jesse David Wall continued to pursue the moratorium petition begun in August 1985. The effort had minor financial support in the form of many small donations from faculty members, as well as active support from faculty members in gathering signatures. Julia Scholand, CCSF Librarian, and Madeline Mueller of the Music Department, joined the efforts, along with teacher Ken Crizer, and local resident and financial analyst Bill Marquardt. Wall recalled the aggressive tactics of members of Bernard Hagan’s truth squads. “They would interrupt us while we were talking to potential petition signers, and argue with anyone willing to sign….Usually you could get a signature, but it took fifteen minutes instead of five.” There were accusations of physical jostling bordering on assault from both sides. By January 1986, the group had procured 12,000 signatures, enough to put the referendum on the June 1986 ballot. Because SNA was a nonprofit community group and couldn’t legally work as a campaign organization, Wall formed SNaP, Sensible Neighborhood Planning Committee, with Ken Crizer and numerous other CCSF faculty members and students. They also had a few local residents, notably Sid Kass from Miraloma Park and Meg Bernstein of Ingleside. In addition, a second group was formed, City College Faculty for Responsible Development (CCFRD), which had the explicit aim of furthering the interests of the college regarding the reservoir land. 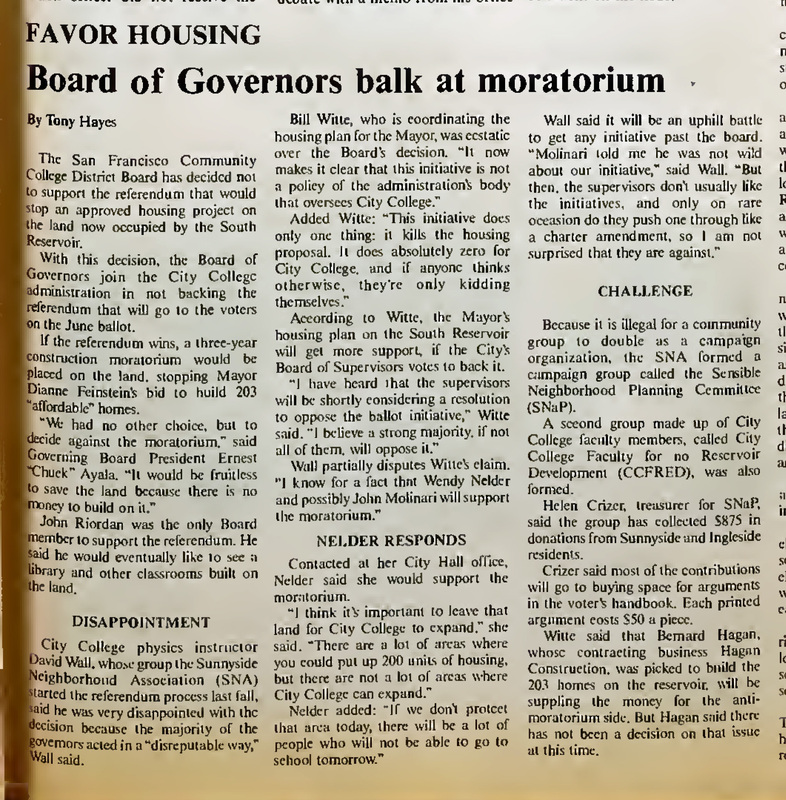 In March 1986, the CCSF Board of Governors came out as officially in favor of housing, taking Mayor Feinstein’s side against Prop E. Bill Witte applauded their stance. Supervisor Nelder was interviewed by a reporter, saying “If we don’t protect that area today, there will be a lot of people who will not be able to go to school tomorrow.” SNaP treasurer Helen Crizer said they had about $900 in donations, which would go toward paid arguments in the voter’s handbook. CCSF Guardsman, 13 Mar 1986. View larger. In April, CCSF students organized to support Prop E marched down Ocean Ave.
17 Apr 1986 student march on Ocean Ave in favor of Prop E and against housing on the reservoir. CCSF Guardsman, 1 May 1986. 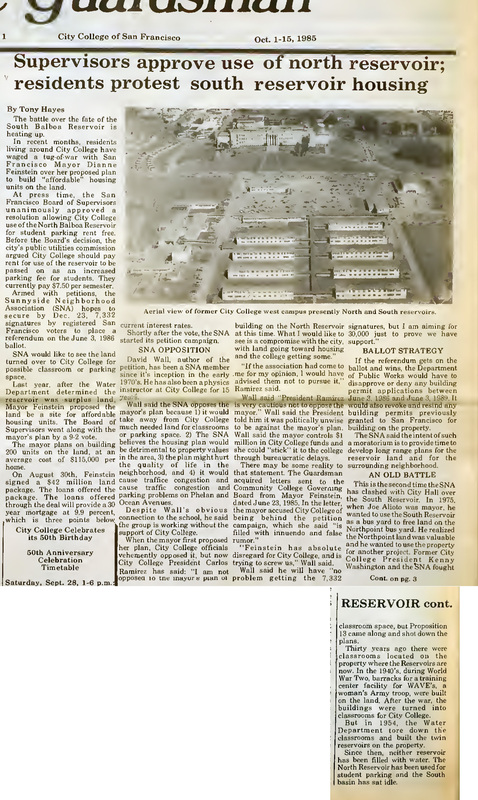 In May, the Campus Query column in the Guardsman asked students what they thought about the use of the south reservoir. What students think about the Balboa Reservoir. The Poli-Sci major seems to have done her homework. CCSF Guardsman, 1 May 1986. View larger. The 3 June 1986 election brought a solid defeat for Proposition E, the three-year development ban for the reservoir, losing by 22,000 votes. This was a proposition where a “yes” vote meant a “no” sentiment—no development, at least for three years. This was one reason Wall later cited for its failure. Of the paid arguments in the voter’s handbook favoring the Prop E development ban and stating a reason, 90% mention City College. Of those, almost 70% were signed by faculty (both present and retired), students, and others professionally associated with the college. Notably, two esteemed administrators, Lou Batmale, retired CCSF Chancellor, and Louis G Conlan, retired CCSF President, signed the first argument in favor. These two were among many CCSF-based members of the honorary committee of SNaP. On the other side there were paid arguments against, from the Mayor, the supervisors (except Nelder), housing advocates, the Planning Commission, politicians, realtors, Ocean Avenue Merchants Association, and a Bernal Heights group. Feinstein characterized the opposition as “a few people.” Pro-housing groups cited the college’s lack of plans to buy or use the property. Almost all cited the need for housing, especially the community housing advocates who used the boiler-plate text handed to them by Prop E opponents, stating the housing was “much needed.” The Chronicle editorial the month before said simply that the college was not growing and did not need the land, urging a No vote on Prop E.
With Prop E now defeated, planning continue apace for the housing project. 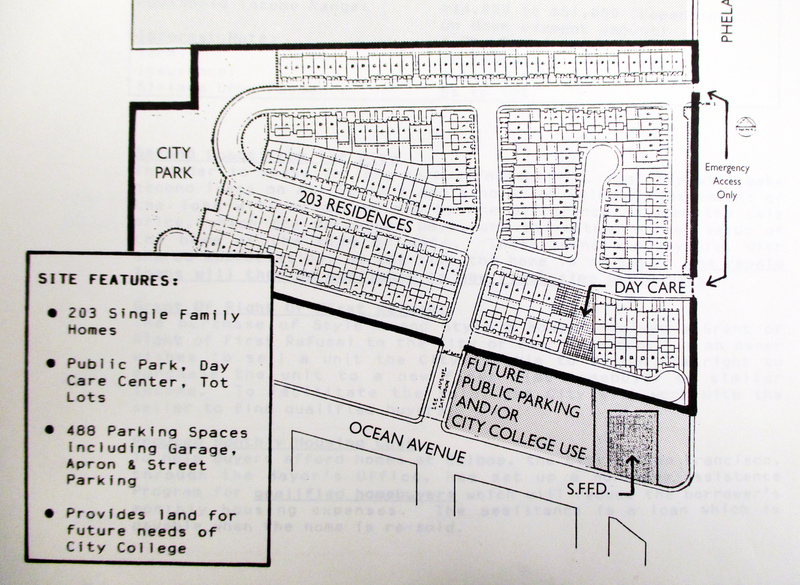 In October 1986 an environmental review was completed, and found “no impact,” largely because the generous allotment of parking places in the plans—490 parking spaces for 203 units—meant no parking crush in local blocks. Again, Supervisor Wendy Nelder was the sole voice against proceeding with the project. In late 1986, the groups that had organized to push Prop E—SNaP and CCFRD—regrouped and licked their wounds. Seeing that another development across town was effectively going to be stalled by a referendum (Prop A) scheduled for the following year (explained in accompanying Examiner article), this letter circulated among them in November, probably penned by teacher Ken Crizer, exhorting the group to follow suit. 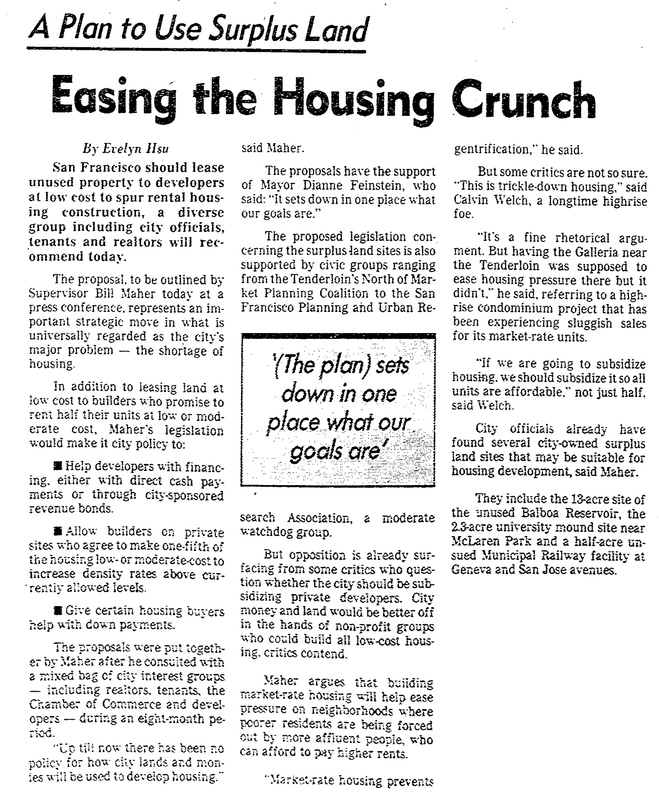 Letter to CCRD members at CCSF urging a similar petition to Prop A (1987) to block housing at Balboa Reservoir. About November 1986. CCSF Archives. View larger. SF Examiner, 11 Nov 1991. Article detailing petition to stop housing development at site of Polytechnic High School building. CCSF Archives. View larger. They started to gather signatures for their own referendum (which will be Prop B), but they had just weeks to do so. It looked grim. The evil genius behind it all? Later Witte and others working on Feinstein’s plan would allege that the group took money from Dr Rider for their own referendum to block Balboa Reservoir housing (Prop B), and that the driving force behind the reservoir housing referendum could be squarely laid on the doorstep of this notoriously vengeful and wealthy man. The story has persisted since then, even being revived in the Chronicle’s obituary for Rider in 2004. 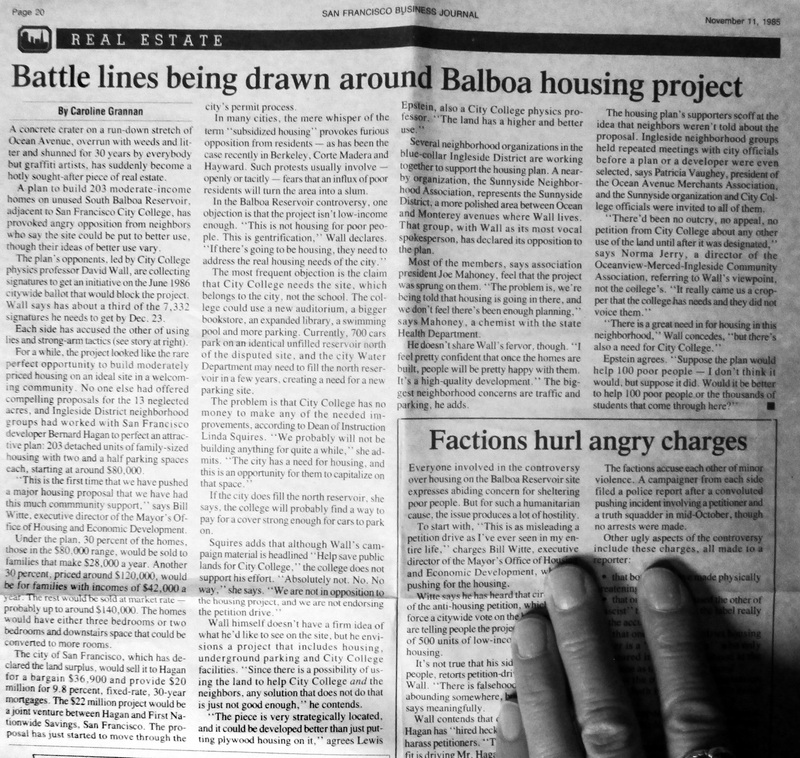 Rider, who had had a running battle with his neighbors and the City over his construction ambitions in his own Parnassus Heights neighborhood around UCSF, was portrayed by City officials in a Chronicle piece in April 1987 as the source of opposition to the Balboa Reservoir housing development. That article also mentioned “a group of local residents” who opposed the reservoir housing development, however without mentioning that it was made up largely of City College faculty or that rationale was based in concerns for the college’s future. Apparently a grassroots resistance, running eventually to many hundreds of faculty members, students, and staff, and led by one very stubborn CCSF teacher, wasn’t a plausible or legitimate opposition in the eyes of the Mayor, her housing people, and the supervisors—and the Chronicle writers who took their cues from them. But according to Wall, the group took no money from Rider for their Prop B effort. In a letter to the Board of Supervisors in 1987 he explicitly denied receiving money. 13 Nov 1987. Letter, from Jesse David Wall of SNaP to the SF Board of Supervisors, including a denial of financial backing from Dr J Alfred Rider. SFPUC Archives. Photo: Harry Bernstein. View larger. But the group members quickly saw that unlike the previous petition effort, they didn’t have time to do it themselves for this referendum. So they raised that money through a set of personal loans. Wall asked his colleagues for bigger donations this time, but the money was still accumulated through a large number of donations, ranging from less than a hundred dollars to a thousand or so this time. 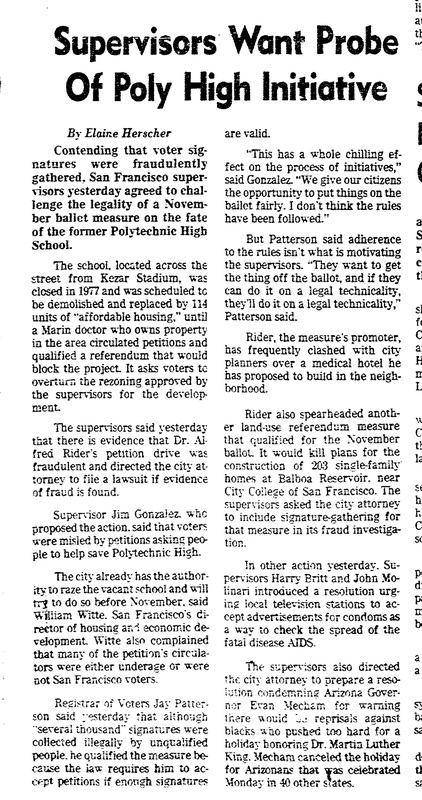 In January 1987, irked by the success of the two referendum petition drives to block the Mayor’s housing efforts—Balboa Reservoir/Prop B and Poly High/Prop A—the Board of Supervisors asked for a probe, alleging that fraud was behind it. Dr Rider was named as “spearheading” the Balboa Reservoir initiative as well as the one he actually sponsored, so the supervisors asked that one to be investigated as well. SF Chronicle, 21 Jan 1987. View larger. In the CCSF Archives, Librarian Julia Scholand carefully retained xeroxed copies of many news items during these years (for which this historian is thankful). On her copy of this particular article, she had uncharacteristically penned a bit of editorial comment regarding the notion that Rider was the engine behind Prop B. A portion of SF Chronicle, 21 Jan 1987, marked by CCSF Librarian Julia Scholand. CCSF Archives. The Prop B measure survived this threat from City Hall. At fifty cents a pop, SNaP had gathered 14,000 signatures by February 1987. In March, Madeline Mueller wrote an editorial in the Guardsman laying out the argument against housing, and on behalf of the college and also the reservoir as a reservoir. The recent massive fire in Bayview had shown what fighting a conflagration of that size required in the way of water—millions of gallons—a foretaste of what post-quake fires might mean for the city. CCSF teacher Madeline Mueller, CCSF Guardsman, 19 Mar 1987. View larger. Proposition B qualified for the ballot for the special election in June 1987, along with Prop A, the Poly High referendum. This time “no” meant no to housing—specifically no to rezoning the reservoir land for housing. SNaP organized paid arguments for the voter’s handbook, with the focus, as before, on City College. A large number of faculty members, student groups, and their supporters argued against Prop B. On the other hand, Dr Alfred Rider’s pet project of vindictively defeating development in his own neighborhood was solidly overturned in a big win for Prop A. So much for the mighty Dr Rider. May we have our land now? The week after the election, apparently having got the message about City College, Supervisors Richard Hongisto and Carol Ruth Silver asked that the City Attorney prepare legislation which would designate the Balboa Reservoir (apparently the whole 28 acres) for the exclusive use of the college for educational purposes. Although Silver had supported housing, she met with CCSF faculty after the defeat of Prop B, and changed her mind. 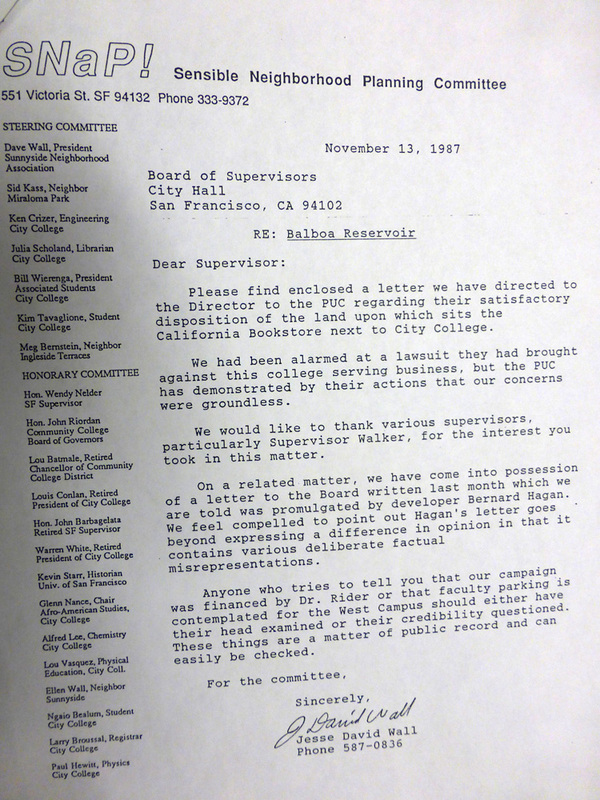 In September 1987, the City College faculty members who had been active in the fight for the reservoir formed a new group, City College Balboa Master Plan Coalition (CCBMPC). CCSF Guardsman, 3 Sep 1987. View larger. An article in the Guardsman in October 1987 highlights the sense of embattlement that CCSF faculty members felt—not just in the face of open hostility from City Hall, but in contending with entrenched complacency on the part of the college’s Board of Governors and administration. Librarian Julia Scholand: “It’s sad that right now faculty and students are doing most of the planning for the future.” Soon a faculty-led group would initiate a state-wide architectural competition to update the college’s master plan (more on which below). In October 1987 the SFPUC made a move to have the “surplus” status of the reservoir land rescinded, as it was now not slated for development. They pursued the matter through to the following July 1988, after the defeat of a second housing proposal for the reservoir, when the water department asked for the land to be returned to the commission, pending further study regarding the water needs of the city. These attempts at rescission of the surplus designation were not successful. After the defeat of Prop B in June 1987, the Water Dept made some attempt to get the balboa Reservoir back under their jurisdiction. CCSF Guardsman, 15 Oct 1987. View larger. Toward the end of 1987, Mayor Dianne Feinstein was in the last days of her reign, before the mayoral election. The Prop B defeat was it seems not enough to put her permanently off her project of building housing at the reservoir. In a bizarre and possibly spite-fueled move in September 1987, she was reported be proposing a “homeless village” on the site. SF Chronicle, 4 Sep 1987. Read the whole thing. “Aides to Feinstein described her proposal yesterday as a brainstorm,” a healthy alternative to the “crime-ridden” Tenderloin hotels where homeless shelters were then located. Modular housing would be constructed on the asphalt floor of the reservoir. The mayor herself was out of town when the plan was publicized, being on a trip to a sister-city on the Ivory Coast. “I think we could landscape,” she was reported to have said. Herb Caen reported on a reader who made fun of her plan, saying “Drowning is NOT the answer” to the homeless problem, a quip that only worked if you’d never been down to the never-wet site. Feinstein, issuing a hurried statement from the Ivory Coast the next day, denied the plan was being pursued, saying it was just one of many ideas for the site. The debacle raises questions about the functionality of her administration at that time. Assemblyman Art Agnos was elected Mayor of San Francisco in 1987, after a close race in November that left him and Supervisor John Molinari neck-and-neck, followed by a run-off in December that gave Agnos the office. The CCSF Board of Governors had supported Molinari, citing his recent support for the college using the Balboa Reservoir. 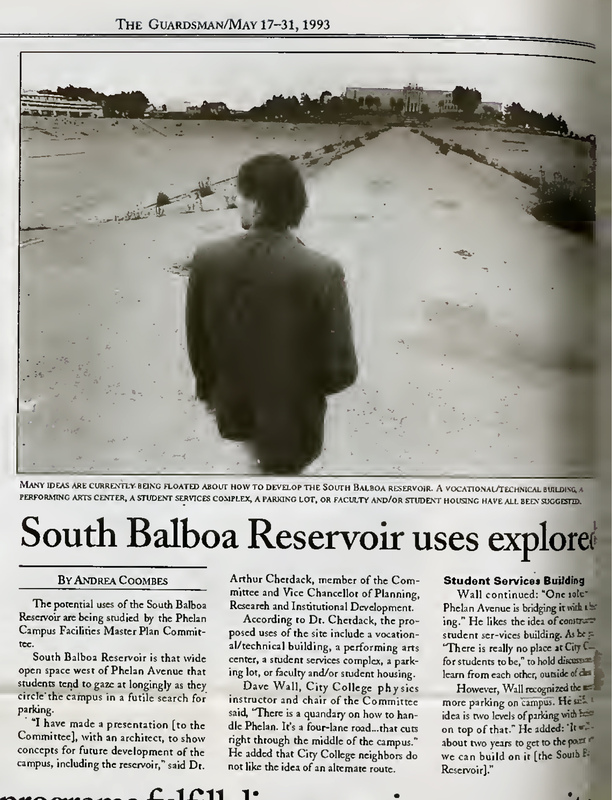 The new administration immediately acted to reintroduce a housing project for the Balboa Reservoir, this time with a plan that added a little nod to City College by including some land designated for its use. Supervisors Bill Maher and Nancy Walker introduced draft legislation to rezone the south basin for housing on 21 Dec 1987. Basically it was Hagan’s plan with an acre or so cut out for City College, wrapping around the fire station on the corner. January 1988. Revised plan for Balboa Reservoir housing site. CCSF Archives. A few weeks later City Attorney Louise Renne ruled that this legislation flew in the face of the voter’s will as expressed by the defeat of Prop B the previous June. Renne: “This ordinance seems to us to be essentially the same as the developer’s project….You can’t renew the same project within a year’s time.” Jesse David Wall stated that the sponsoring “Balboa Neighborhood Committee” was a front for the developer Bernard Hagan—a bit of astroturfing—and Frank Noto, a member of that committee, unabashedly confirmed the fact. Chuffed with their victory in defeating Prop B, and despite the failure to convince the Board of Supervisors to give the land to the college, the faculty members who had fought the housing issue met in January 1988 as City College Balboa Master Plan Coalition (CCBMPC) in order to set about sponsoring a statewide architectural competition for a new master plan for the campus. If the absence of a college plan for the land was standing in the way of the City giving it to CCSF, then this stood to be rectified. In the months that followed, there was some difficulty about finding a professional advisor to moderate and judge the competition. 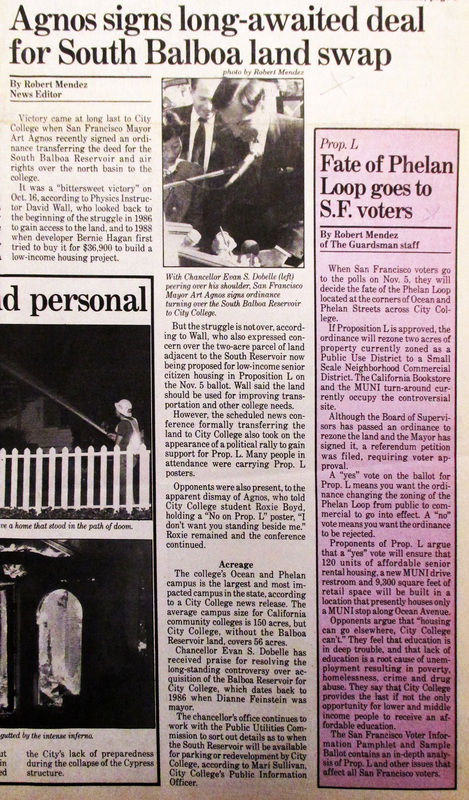 Meanwhile, Agnos worked toward putting another measure on the June 1988 ballot for housing at the Balboa Reservoir—Proposition L. The City had been counting on previously approved revenue bonds to fund the affordable part of the housing plan, and could lose them if the project didn’t go forward. The plan was precisely the same as Hagan’s plan for Feinstein. 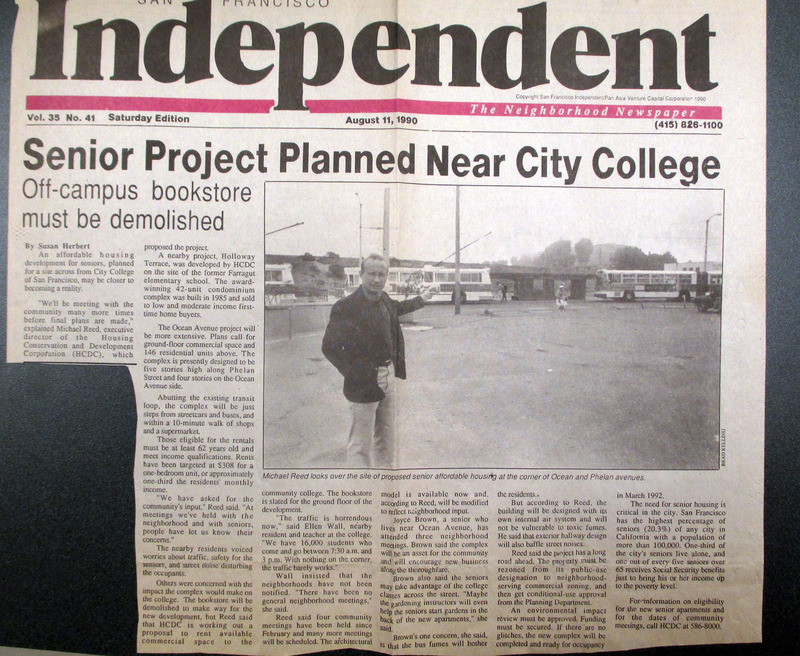 The Chronicle noted in the same article that City College had been unsuccessful in persuading the Board of Supervisors to give the property to the college, and that it was hosting an architectural contest, intent on building a library, auditorium and bookstore, among other ideas, on the land. But this time he did not garner even the tacit support of the CCSF administration. By May 1988, with the election looming in a few weeks, it got hot and heavy. The City College faculty group CCFRD sued Mayor Agnos for published false and misleading information in the voter’s handbook for the June 1988 election. Specifically, Agnos claimed that that the reservoir “never was the ‘west campus’ of City College.” The statement was patently untrue, and the SNaP group got civil rights lawyer Charles Garry to pursue the matter. Unfortunately the presiding judge refused to sign the writ. Unable to pursue their lawsuit, SNaP cut their losses, but the affront rankled. The handbook also stated that City College had campuses all over the city to serve students, but this was a mischaracterization of the seven Community College Centers that at that time served adult education and not accredited degree programs. In turn, Bernard Hagan alleged that SNaP members had slandered him in the voter’s handbook—sending them all hand-delivered letters from his lawyer—for dredging up a news items that questioned Hagan’s license and referencing a lawsuit of Hagan’s that involved the eviction of elderly residents from property he owned. SNaP said that these accusations had been dropped. Pokey little drawing in the HUD environmental review. That stop sign at Lee Avenue will certainly fix any traffic congestion problems that might arise. View whole page. 1988 HUD environmental review, map. So those City Hall folks could figure out where the heck it was. Read report. 1988, HUD environmental review. “No impact.” Read report. About that time the City College group formed a partnership with Marsha Fontes, publisher of the Sunset Independent newspaper. 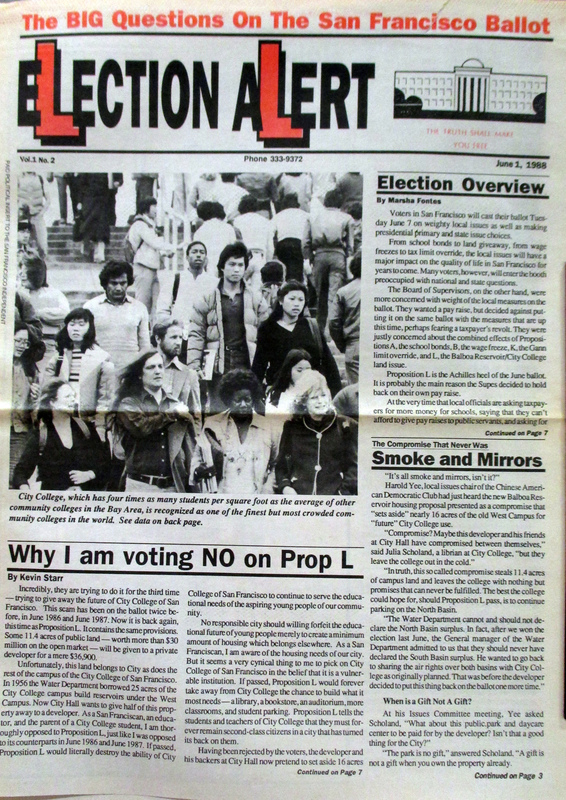 In May and June, two issues of a newspaper-style flyer called “Election Alert” were produced with her help, which presented an impressive array of support for the No-on-Prop L campaign—nicknamed “L NO!”. June 1988. “Election Alert” newspaper-style flyer for the No on Prop L campaign. SAN FRANCISCO HISTORY CENTER, SAN FRANCISCO PUBLIC LIBRARY. View larger. In the centerfold there were the names of over 350 CCSF faculty and staff members who had signed onto the opposition, and the smiling photos of famous City College alumnae O J Simpson and Lee Meriwether, who urged readers to vote no. June 1988. Centerfold from “Election ALert” newspaper flyer for No on Prop L campaign. SAN FRANCISCO HISTORY CENTER, SAN FRANCISCO PUBLIC LIBRARY. View larger. June 1988. Photo from “Election Alert” flyer, No on Prop L. Jesse David Wall (L) and Lee Meriweather at Diego Rivera Theatre. San Francisco History Center. There was a list of twelve campus groups, ranging from the nonprofit City College Foundation to La Raza to the Black Student Union to the Campus Police Service Organization. The list of “prominent San Franciscans” opposing included Wendy Nelder, Terry Francois, and Quentin Kopp. 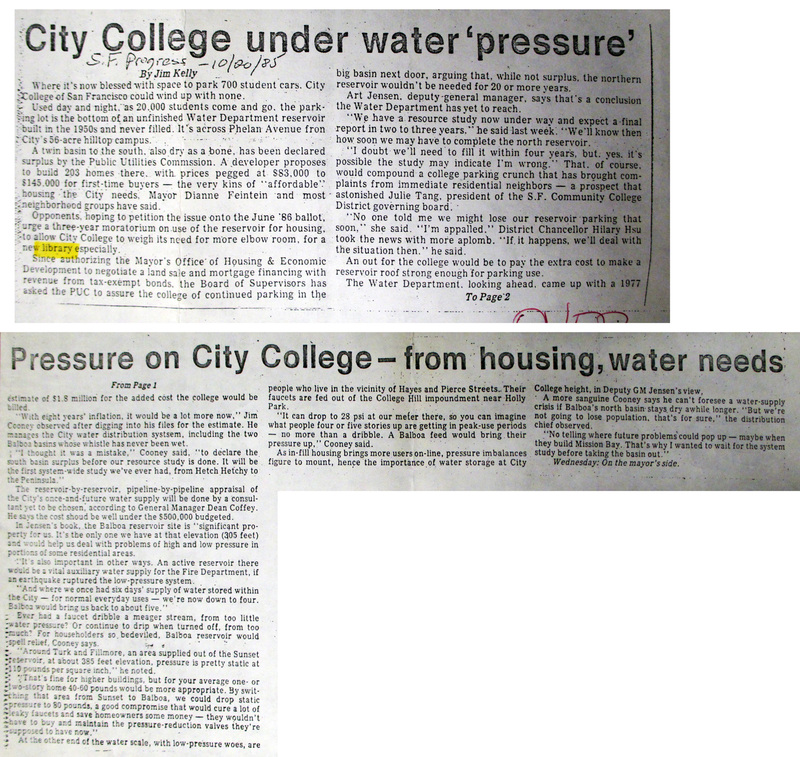 In article-like editorials CCSF teacher Ellen Wall argued for the common goal of City College’s future; environmentalist Ruth Gravanis argued for the future of San Francisco’s water system and the importance of the Balboa Reservoir to it; and California historian Kevin Starr argued for the future of the college and against the giveaway of public land. 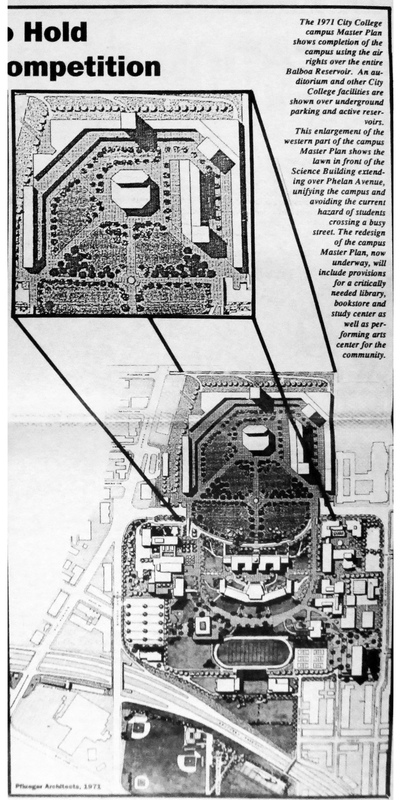 The 1971 master plan by Pflueger Architects was reproduced, next to the announcement for the CCSF architectural competition to update it. The plan shows the entire reservoir land in use by City College, with decking over Phelan Avenue, thus connecting it with the main campus better for students. A supporter of the cause painted a large “L NO” on the floor of the South Basin about then. 1988, maybe May. View of the South Balboa Reservoir, from Science Hall hill, with “L NO” graffiti’d on floor. From CCSF Archives. On the other side of the issue, Prop L boosters sent postcards to targeted voters. These are from “San Franciscans for a New Neighborhood” at 325 Highland Ave.
1988. Postcard for Yes on Prop L campaign. San Francisco History Center. 1988 Back of postcard for Yes on Prop L campaign. San Francisco History Center. Breaking down the June 1988 voter’s handbook, there were 39 paid arguments against Prop L (39). Of those that gave a reason, 63% mentioned City College explicitly. Of those, 70% are signed by individuals or groups identified with the college. About 20%of the total are the classic “NIMBY” type (anti-parking and traffic issues) or anti-tax from non-college-affiliated sources. The submissions from SNaP included one reverse-psychology item penned by CCSF teacher Lewis Epstein, inserted in the arguments in favor. Wall said they had this one strategically placed at the end of the section, a spot many voters in a hurry skip to read. 1988 June voter’s handbook. Argument in favor of Prop L by CCSF teacher Lewis Epstein. Read voter’s handbook. On the other side was a range of paid arguments for Prop L (13 total), with about a quarter coming from community groups and local residents, including residents in Westwood Park and Sunnyside. Tenant and housing groups account for about 15%, and the remaining arguments (seven) are from parks advocates, local clergy, a tax-payer group, ex-Mayor Feinstein, Supervisor Walker, the Chamber of Commerce, and childcare advocates (a childcare center was planned for the development). The voters said No to housing again; Proposition L failed in the June 1988 election, with a very slim margin of just under one thousand votes—Yes 49.6% to No 50.4%. The pro-City College forces won. Bill Marquardt, financial analyst for the opposition and Sunnyside resident who had been part of the fight from the beginning, wrote a triumphant letter to the Chronicle, with an unspoken reference to Wall, who went at that time by his middle name, David. SF Chronicle, 14 Jun 1988. Letter from Bill Marquardt. Within weeks of the election, the Board of Supervisors passed Resolution 597-88 urging the mayor to urge SFPUC to sell the Balboa Reservoir to City College for one dollar, presumably the entire 28-acre property. It passed 9-2, with Nancy Walker and Doris Ward dissenting. The transfer would be contingent on the college using the property for educational purposes within ten years. However agreeable to housing he had been in the past, Chancellor Hilary Hsu at this point vowed that the CCSF Governing Board would continue to seek possession of the land. The San Francisco Community College Board authorized $40,000 for the contest. SF Chronicle, 23 Jun 1988. 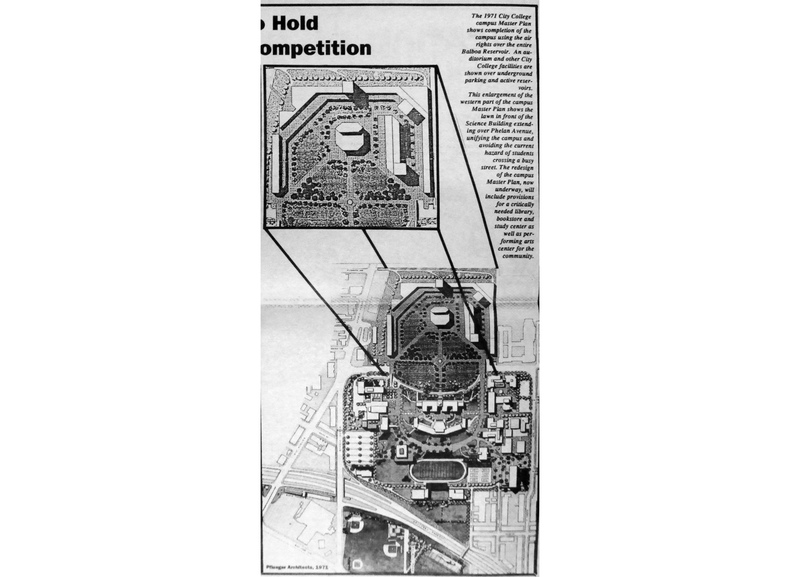 By April 1989, a winner was selected, and CCSF had a new plan. The centerpiece was a plaza connecting the two sides of Phelan Avenue; the plan included a performing arts complex. The winners were the Oakland architects Rick Williams and Timothy Van Meter. The college was desperately in need of a library of appropriate size, with funding reported to be on the way in the governor’s budget for the next year. 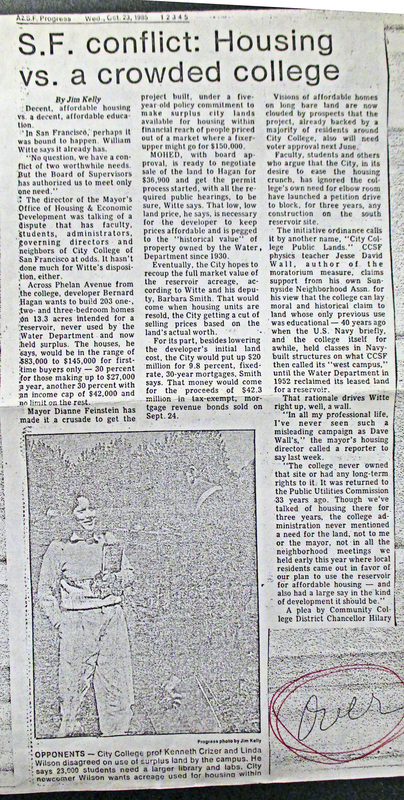 Negotiations with Mayor Agnos about giving City College the Balboa Reservoir land did proceed; CCSF officials Chancellor Hilary Hsu and members of the Board of Governors met with the mayor in June 1989. Agnos held out, refusing to agree to the deal until February 1990, when a land swap was proposed. The deal first proposed involved the college giving up property at 33 Gough Street, but the parties later settled on a trade of CCSF-owned land at 17th and Folsom Streets in exchange for the South Basin. At last City College would have its piece of the reservoir. SF Chronicle, 22 Mar 1991. The property at 17th and Folsom was about 1.4 acres, and then had a parking lot on it. (Recently the In Chan Kaajal Park was constructed on the portion next to 17th Street. The other half is still a parking lot, and has been slated for affordable housing—yet unbuilt—since 2011. While the architectural competition was proceeding at a good pace and the land-swap was being negotiated, Mayor Agnos’s housing people simultaneously pursued a new housing project for an adjacent site at the corner of Phelan, touching on the southern berm of South Balboa Reservoir. In January 1990, when Tom Jones of the Mayor’s Office of Housing discussed the possibility with the Public Utilities Commission that owned the land, the PUC General Manager Thomas Elzey asked Mr Jones if City College was being consulted in the matter. Jones denied there was any conflict with the college. Elzey’s point was obvious—college faculty nixed your plans before, and it could happen again. It may have been that Mayor Agnos imagined that City College—then in the process of being bestowed with more than 12 acres of the reservoir land by the swipe of Agnos’s pen–could not possibly object to this little 1 ½ acre senior housing project next door. Unfortunately he was wrong. 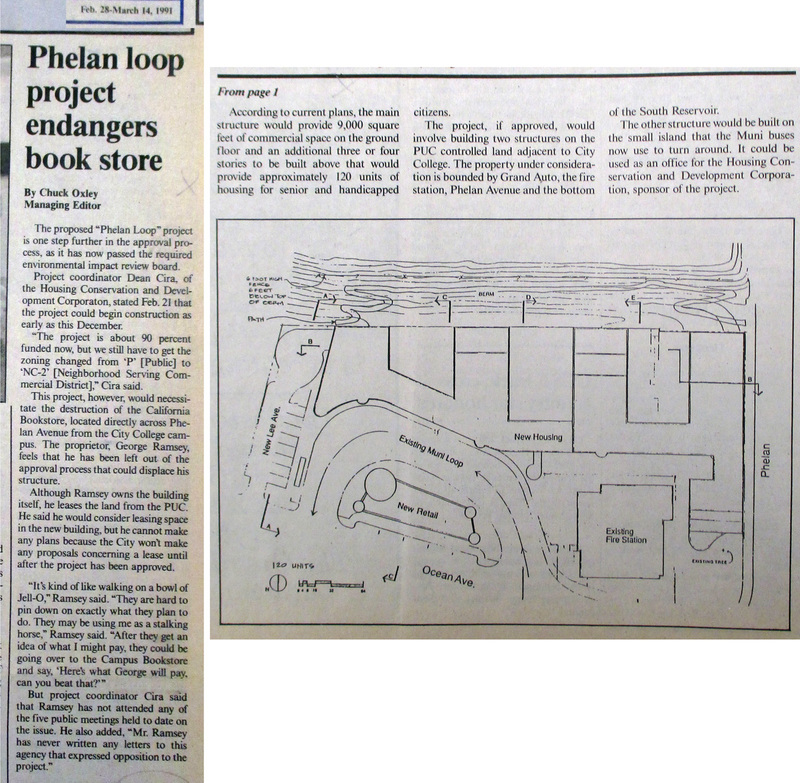 The 1991 Phelan Loop Project—which was actually a version of the original Second Phase for the reservoir land, planned back in 1985—was to have 120 affordable housing units for seniors, in buildings three to four stories tall with retail space, all wrapped around the fire station and Phelan Loop Muni turnaround. It would have meant the demolition of the old bookstore that still stands on the property. The Independent first reported on it in August 1990, when the number of unit and stories were higher. Here is a drawing from the Guardsman, 28 Feb 1991. Drawing of Phelan Loop Project for senior housing at corner of Phelan and Ocean Avenues.. CCSF Guardsman, 28 Feb 1991. Read article here. City College Station, aka Phelan Loop, 1975. Fire Station on right. OpenSFHistory.org. New CCSF Chancellor Evan Dobelle was more vocal than his predecessors about advocating for the City College’s future; while he was busy negotiating for the reservoir land-swap, he also voiced some skepticism about the Phelan Loop Project in April 1991, saying that the housing should serve CCSF needs and the community space could be used for tutoring or other college academic activities. Wall talked with Dobelle that spring and came to understand that he and his group had Dobelle’s unofficial support for another fight. Again, they had just weeks to submit sufficient signatures to put a referendum on the ballot, a proposition challenging a City project. He knew from experience it cost money to get the signatures, tens of thousands of dollars. Wall’s wife, Ellen Wall, had been a part-time teacher at the college in the English Department for some time, and had asked before this to be hired full time. Dobelle then hired Ellen Wall full time, thereby doubling her salary. This left the Walls feeling sufficiently flush to ask a friend for a $20,000 loan, which funded the petition drive. By July 1991, the group had turned in 30,000 signatures to force a referendum on the November 1991 ballot. 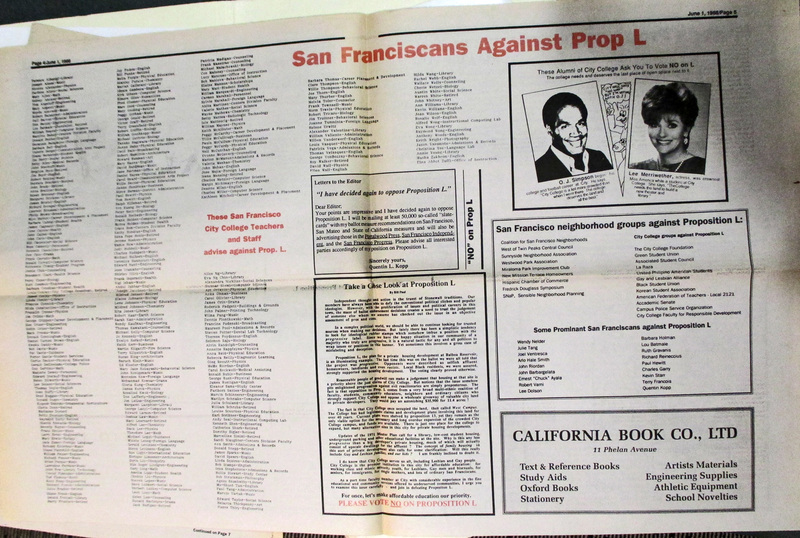 They produced another newspaper-like flyer on the proposition, which was—like the one in 1988—called Prop L. Many of the same arguments from 1988 were rehashed and reused. Nov 1991. “Election Alert” newspaper flyer, from No on Prop L campaign. CCSF Archives. Objections focused on City College’s future use of the land, local traffic congestion, and the inappropriateness of housing seniors next to a diesel bus facility. Wall offered several rather spurious arguments, saying that the land on the corner had been part of West Campus–which it hadn’t, being used just for storage by the PUC for years, until the fire station was built in 1950. Wall objected vehemently to any housing on any land that might possibly be used by the college, however remote or appropriate the possibility. In October 1991 the Chronicle ran a piece on the battle. SF Chronicle, 22 Oct 1991. View larger. Meanwhile, the land-swap deal when through between the city and CCSF. SF Chronicle, 15 Oct 1991. View larger. 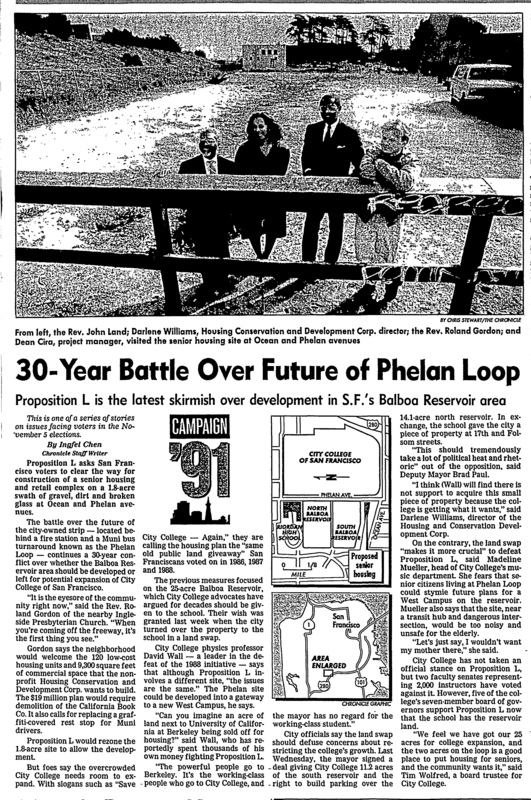 In November 1991 Prop L, the Phelan Loop Project, was defeated by a large margin, 15,000 votes. Mayor Agnos would then lose his bid for reelection in a run-off with Frank Jordan the next month, by 8,000 votes. Jordan stressed fiscal responsibility, cost cutting, and clean streets in his initial remarks after the run-off, with nary a mention of housing. City College, now endowed with its half-reservoir, went forward with plans for the land, but ran into inevitable funding issues. In May 1993, this article ran in the Guardsman, which says the uses of the land were being studied by the Facilities Master Plan Committee. CCSF Guardsman, 17 May 1993. Discussion the various uses that could be made of CCSF’s property on the Balboa Reservoir. View larger. A library on the reservoir land had been talked about since 1987, but eventually a site on Cloud Circle was chosen and it was completed in 1995–the Louise and Claude Rosenberg Library. By 1993, the idea of using the South Basin for additional parking was ventured by Dean of Student Activities Jennifer Biehn. By 1996 the minutes of the SFPUC show that the commission was considering allowing a ditch to be cut through the middle berm, to allow cars to use the South Basin for parking. However, the solution chosen was ramping, put in place by 1998, expanding the parking facilities for CCSF at the reservoir. 2001. Aerial of the Balboa Reservoir after parking was opened in the South Basin. Google Earth historic imagery. The first structure City College built on the reservoir land, the Multi-Use Building, was completed in 2010. CCSF Multi-Use Building, 55 Phelan Ave. The other major structure planned for the reservoir land is the Performing Arts Education Center (PAEC). Architect’s rendering, CCSF Performing Arts Education Center. The need for of a performing arts center for the college has been outstanding and unfulfilled for decades. After losing use of the 1000-seat Navy-built auditorium on West Campus in 1955, the college has had to make do first with borrowing the Riordan High School auditorium—though everyone liked the velvet-upholstered seats—then with the 283-seat Diego Rivera Theatre, as well as off-site facilities with greater capacities. Placing an arts complex on the reservoir land has been part of plans since the 1988-89 CCSF architectural competition. Bonds were passed by SF voters in 2001 and 2005 that included funds for this facility. Architects’ plans for the Performing Arts Education Center (PAEC) were drafted and publicized in 2007, cancelled during the accreditation crisis in 2013, and then recently revived by the CCSF Board of Trustees. Not only of great benefit to the college, the performance facilities at PAEC would fulfill a need in the city’s arts community and enrich the quality of life in the south-central part of the city. Being close to a BART station could mean car-free access for attendees from all over the Bay Area, something many downtown theaters clearly benefit from. Read more about the PAEC here. Although the bitter ballot fights of thirty years ago about housing versus City College on the Balboa Reservoir land are very unlikely to be repeated, many of the reasons behind the opposition then remain today. The current plans are contentious for both local residents and those who work for or attend City College. Local residents currently still anticipate and dread increased automobile congestion and parking problems. Those in the college feel it has been undermined by forces inside and outside the institution, and that the guidance and support it needs to improve have been lacking for many years. Thirty years has brought a change in attitude about planning for driving and parking. The current housing project aims to discourage those in favor of transit use, despite current shortcomings in the transit system in the area, and the nearby I-280 freeway exit/entrance which promises heavy automobile traffic in the area for the foreseeable future. 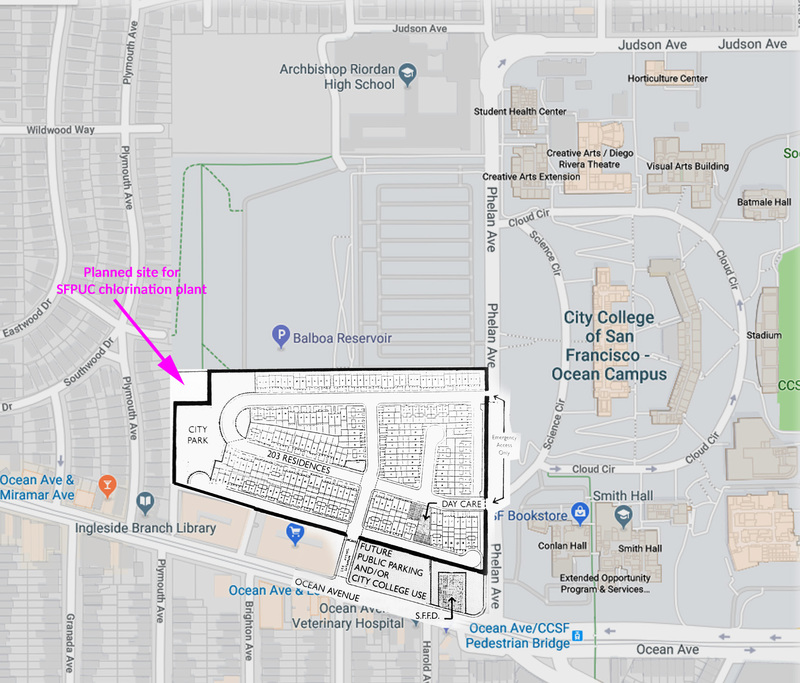 Thousands of City College parking places will be lost that are currently on the land where the housing will be built, which is likely to affect enrollment. The present housing project aims to be much denser than the 203 houses planned in 1985—1100 units is the current figure. Instead of 100% home-ownership, this project will have 90% rental properties. Instead of 2 ½ parking places per unit, it will have one place for every two units (0.5). Instead of 60% affordable (1985), it will have 50% low- and middle-income units. Instead of cutting off San Ramon Way, there is to be pedestrian access there. Instead of a 1.25 acre park, the contiguous park space is to be 1.5 acres. Both the 1985 plan and the current version have a childcare facility. In 2015, Supervisor Norman Yee put legislation in place for a community input structure for the project, the Community Advisory Committee, which seems a great improvement on the botched community process that dogged the first housing project. It meets regularly and aims for transparency. Read more about the current Balboa Reservoir project. Here is a video showing a series of aerial photos of the Balboa Reservoir from 1993 to 2017. Watch the middle berm disappear, the north-south to east-west alignment change, and the Multi-Use Building go up, as well as changes on Ocean Ave.
South Basin opened to parking. First Balboa Park Station Area Plan. I didn’t find it. Proposition A passes with a huge margin, bonds for Community College, including a performing arts complex for CCSF. 2003 Aerial photo via Google Earth, showing south berm and Phelan Loop. Community effort of Ingleside Presbyterian Church, with support from Wendy Nelder, to improve and landscape the area behind the Phelan Loop, including the installation of “LOVE IS THE ANSWER” in white painted railroad ties. Center berm is removed. South Basin continues to be used for parking. Planning for what will be called the Multi-Use Building (MUB) (55 Phelan Ave). First show of the architects’ plans for the Performing Arts Education Center (PAEC). South berm is removed, in preparation for construction of the MUB, along with “LOVE IS THE ANSWER”. The second Balboa Park Station Area Plan, which lists 500 housing units for the future on reservoir land. Negotiations proceed on N/S to E/W realignment of CCSF and SFPUC portions of reservoir. An updated Balboa Park Station Area Plan. Kragen Auto Parts building is demolished (1150 Ocean Ave). Multi-Use Building is completed in the fall. Mixed-use buildings constructed on Kragen site (1200 Ocean Ave) by AvalonBay developers. Bike lanes go in on Phelan Ave, reducing number of car lanes. New buildings at 1200 Ocean completed, with Whole Foods on ground floor. Accreditation Crisis at City College. Official land realignment between CCSF and SFPUC, giving CCSF the portion next to Phelan, a deal in which CCSF lost a small amount of acreage. SaveCCSF formed, with students, faculty, and staff members. Phelan Loop is reconfigured around the fire station at 1000 Ocean Ave, in preparation for new construction at 1100 Ocean Ave, site of old Phelan Loop. PAEC is cancelled by CCSF Special Trustee Robert Agrella. Construction of 1100 Ocean Ave mixed-use building by Mercy Housing. Mayor Ed Lee wants to develop housing on the Balboa Reservoir. Supervisor Norman Yee establishes the Balboa Reservoir Community Advisory Committee by legislation. View of Unity Plaza with Multi-Use Building in background. From Friends of Monterey Boulevard. Mar: Plans for the PAEC resurrected by CCSF Board of Trustees. May: Three developers invited to submit proposals for the Balboa Reservoir housing project. Aug: Avalon Bay/BRIDGE chosen developer team for Balboa Reservoir housing project. Mar: A City College-based coalition submits ballot measure to prioritize building of the PAEC before Balboa Reservoir construction. My sincerest thanks to Harry Bernstein for generously sharing his research on the Balboa Reservoir. Without his diligence at unearthing facts and documents, I could not possibly written the article that I did. Photos of archive material not otherwise credited by Amy O’Hair. Read the Guardsman, newspaper of City College of San Francisco: https://archive.org/search.php?query=creator%3A%22City+College+of+San+Francisco%22&sort=-date&page=2 Years 1990-1991, 1991-1992, and 1994-present are missing.